Located opposite South Quay station and just minutes from central Canary Wharf, CCT Venues-Docklands in London offers a breath of fresh air in this bustling business district. Its private waterfront terrace lends itself to events with a difference. And its outdoor area isn’t the only feature that sets CCT Venues-Docklands apart. 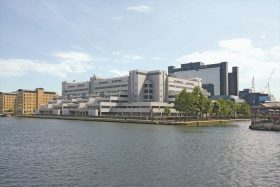 Reopened after renovations in May 2018, it boasts a wealth of flexible conference, training and meeting rooms which can accommodate up to 250 delegates, thoughtfully designed interiors inspired by the history of Docklands, and a stylish restaurant – run with passion by our acclaimed in-house chefs.